To be honest, I never would have thought to say that I have officially moved into a new apartment! I did mention about moving a couple times on the blog, but this didn’t turn out exactly how I expected it to. Firstly, my parents have been house-hunting like madmen, practically jumping to every open house after another every other day. Luckily, I didn’t have to join them for the majority of the times they went because my opinions don’t really play a huge role in where we live due to my awaiting departure to college. Secondly, we haven’t exactly found a house yet, but we’ve settled into this cozy apartment and are planning on staying for three months until my family moves into another house around the area. At last here we are, and here I am on a mattress with a swollen post-wisdom tooth surgery face and terrible Wi-Fi. But you gotta deal with whatcha have. All during this madness when we still lived in our original home otherwise, my sister and I discovered how truly magical Japanese sweet potatoes are. Let me tell you that they truly are a wondrous food, and you’ll be surprised how many things you can shape them into! On the flip side, the two of us did try making sweet potato gnocchi, which was a bloody failure. Luckily, they turned into sweet potato pretzel bites thanks to my cleverness (that comes on rare occasions) and now, they are flatbreads! Flatbread has been and is still now a splendidly popular variation of bread. It is a huge staple in many kinds of cuisines and has sculpted itself into other forms such as a Mediterranean pita, Indian naan, Armenian lavash, Ethiopian injera, Ugandan chapati, Singaporean roti prata, Caribbean johnnycake, and who could forget: the Mexican tortilla! 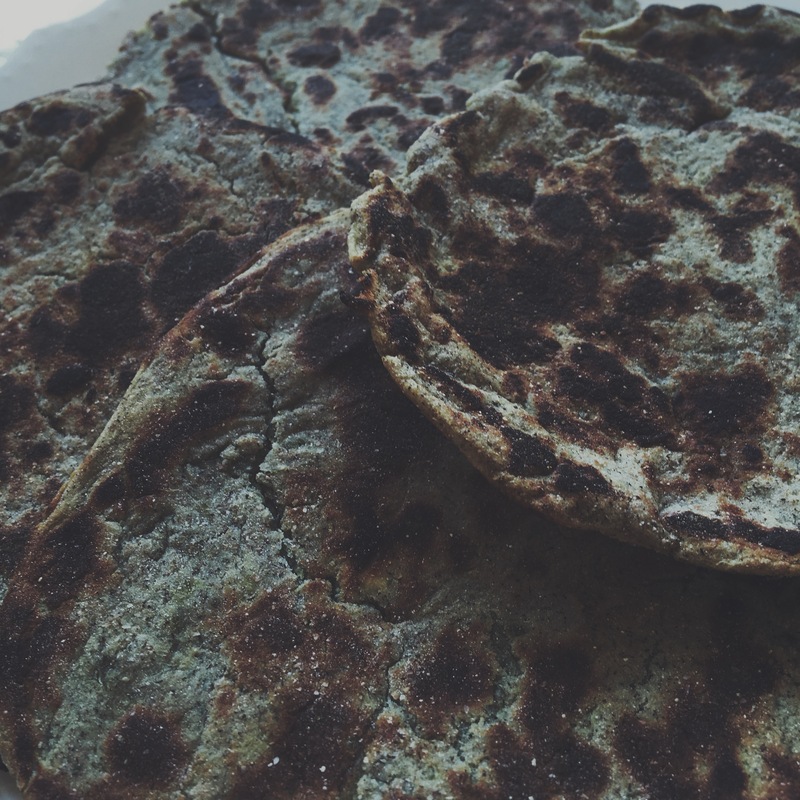 They are usually enjoyed as an appetizer or accompaniment with entrees, but many recipes incorporate flatbreads into main dishes by replicating certain foods such as pizzas, wraps, tacos, burritos, tostadas, raviolis, empanadas, chips and crepes! However, we can do all that after the real madness happens. Take a sweet potato. Roast it well. Peel it completely. Mix with a little gluten free whole grain flour. Shape into crusts. Pan-fry well. DEVOUR. It’s as if you look into the phenomenon of a sweet potato like Alice would in the dark garden hole, and soon you fall into a whole new world of craziness. Or you become too emotionally attached to a house that looks like that of a beach resort, only to cry your way downhill because it’s already been sold or it’s way out of the budget. 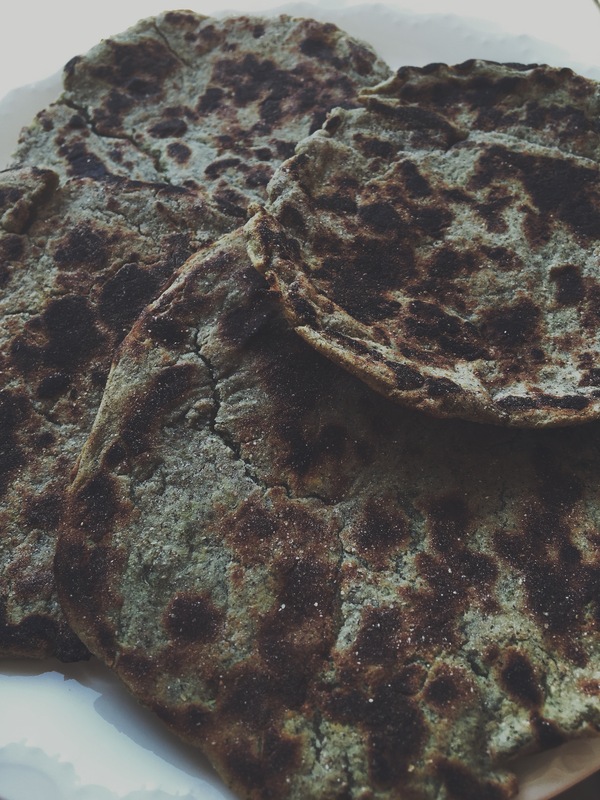 Seriously, your mind will be blown by how easy this recipe is, AND how similar these flatbreads taste to the real deal! Come to think of it, I don’t know what’s even crazier: going on a soup cleanse with a blowfish face, or molding sweet potatoes into anything and everything. If I could cook with sweet potatoes for the rest of my life, might as well dig a deep hole to Wonderland and serve these flatbreads with tea at the Mad Hatter’s un-birthday. Peel the skin off of your cooked sweet potato completely. For a good idea of how to cook a sweet potato, use the procedure at this link. In a bowl, combine both ingredients very thoroughly until the mixture forms a very thick, doughey and creamy consistency. Let the dough chill in the fridge for 20 minutes to half an hour. Heat a nonstick pan on medium heat. Spray with nonstick spray if necessary. Divide the dough into quarters, flattening each piece into a frisbee-like shape. Carefully pan-fry each side of each flatbread until the sides are cooked and browned on the edges. Let the flatbreads cool or serve warm. What foods do you find magical? Do you have a favorite type and use for flatbread? AHHH! I bought buckwheat flour yesterday so I can actually make this! Already super excited. Yours turned out beautifully. Saved the recipe to my Notes!